APOE, which encodes apolipoprotein E, is the most prevalent and best established genetic risk factor for late-onset Alzheimer’s disease. Current understanding of Alzheimer’s disease pathophysiology posits an important role for apolipoprotein E in the disease cascade via its interplay with β-amyloid. However, evidence is also emerging for roles of apolipoprotein E in the disease process that are independent of β-amyloid. Particular areas of interest are lipid metabolism, tau pathology, neuroenergetics, neurodevelopment, synaptic plasticity, the neurovasculature, and neuroinflammation. The intent of this article is to review the literature in each of these areas. Alzheimer’s disease (AD) is the most common cause of dementia in older people and a rapidly growing public health issue. Research over the preceding two decades has led to important insights regarding the potential role of β-amyloid, the primary constituent of plaques, in AD pathogenesis, yet well-conceived therapeutic strategies based upon the amyloid cascade hypothesis have failed to achieve significant disease modification. The most prevalent and best-established genetic risk factor for late-onset, sporadic AD is APOE, encoding apolipoprotein E (apoE), first described in the early 1990s . Frequently, the role of APOE in AD risk is understood in the context of the interplay of apoE with β-amyloid, and this topic has been recently reviewed . However, there is a growing body of literature supporting additional roles for apoE in AD risk, both via its normal physiological function and via pathogenic dysfunction that is independent of β-amyloid. Recent debate has focused on the efficacy of elevating or decreasing apoE levels as a therapeutic strategy, and it remains unclear what fraction of apoE-related risk is representative of a loss of normal apoE function versus a gain of toxic function. For these reasons, APOE warrants significant study as an independent factor in AD. Established and emerging areas of investigation include effects on lipid metabolism, tau pathology, neuroenergetics, neurodevelopment, the neurovasculature, and neuroinflammation. The intent of this article is to review and assess research in each of these areas. APOE has three common alleles in humans: APOE ϵ2 (US frequency ~10%), APOE ϵ3 (US frequency ~70%), and APOE ϵ4 (US frequency ~20%) . When compared with persons homozygous for APOE ϵ3 (risk neutral), APOE ϵ4 homozygotes have up to 15 times the risk and APOE ϵ4 heterozygotes up to four times the risk for developing AD. APOE ϵ2 is associated with decreased risk for AD . apoE is a 34 kDa, 299 amino acid glycoprotein with two major functional domains. The N-terminal domain of apoE exists as a four-helix bundle containing the apoE receptor binding region at residues 136 to 150. The C-terminal domain has an α-helical structure and contains the major lipid binding region at residues 244 to 272. A hinge region containing residues 165 to 215 links the terminal domains when the protein is unbound by lipid. The encoded proteins differ at two amino acids – apoE2 has cysteine at residues 112 and 158, apoE3 has cysteine at residue 112 and arginine at residue 158, and apoE4 has arginine at residues 112 and 158 . apoE4 is considerably more likely to exhibit a phenomenon known as domain interaction due to the presence of arginine at residue 112 . The location of this residue is thought to result in the side chain of the arginine at residue 61 (N-terminal domain) forming a salt bridge with the glutamate at residue 255 (C-terminal domain) . While this model has been challenged [7, 8], these alternative studies used a mutated version of the protein (F257A, W264R, V269A, L279Q, and V287E), and therefore may have limited physiological relevance, particularly in the absence of a direct comparison between apoE3 and apoE4. In summary, the structural differences between apoE3 and apoE4 are thought to be important for apoE4’s association with AD pathophysiology, although the picture is far from clear. The primary functional role of apoE in the brain is to transport cholesterol and other lipids, which are vital for multiple functions including synapse formation and repair. apoE is highly expressed in the liver and brain (with the primary brain source being astrocytes), and in the brain is associated with high-density lipoprotein-like lipoproteins . apoE is secreted and loaded with lipids via the ATP-binding cassette transporter (ABCA1) to form lipidated lipoprotein particles. Endocytosis of these particles occurs via interaction with apoE receptors, namely low-density lipoprotein (LDL) receptor (primarily in glia) and LDL receptor-related protein 1 (primarily in neurons) . Important to note is that despite its low expression in neurons at baseline, apoE can be significantly expressed in neurons in response to injury or stress . While there are apparent structural differences between apoE isoforms, the differential impact on lipid metabolism and the relation to risk for AD remains an open question. Data from neuronal cultures support apoE4’s acceptance of lipids being impaired in comparison with apoE2’s acceptance in both astrocytes and neurons . Mice expressing human apoE4 have altered cholesterol and lipid metabolism in the brain . Notably, effects on lipid transport may have a particular impact on synaptogenesis and neurodevelopment, as discussed in a later section of this review, as well as the ability to repair membrane damage. In this case, apoE4-associated risk would represent a loss of protein function. Additionally, apoE is known to have significant impacts in the periphery, with apoE4 being associated with hyperlipidemia and heart disease . How these peripheral effects may impact the risk association of apoE with AD is unknown, and it is important to note that there is little interaction between brain and peripheral cholesterol metabolism . The cellular source of apoE is highly regulated; neuronal production of apoE appears to be mediated by signals from astrocytes . Neuronal apoE is known to be upregulated in response to injury [16, 17]. Postmortem human samples showed that apoE4 undergoes neuron-specific proteolysis , and that this is dramatically pronounced in comparison with apoE3 and apoE2. This effect is thought to be due to apoE4’s tendency to exhibit domain interaction. Transgenic mice expressing human apoE4 demonstrate that apoE4 is cleaved by a putative chymotrypsin-like serine protease termed apoE cleaving enzyme (AECE) . Although neurons take up apoE secreted by astrocytes (the normal physiological process), this apoE proteolysis occurs in the neuronal secretory pathway and not in an endocytic pathway, which seems to indicate neuronal-source specificity to this event . The biochemical stability of apoE is dependent on C-terminal segments [21, 22]. AECE-cleaved apoE4 missing C-terminus residues 272 to 299 (apoE4∆272–299) can translocate from the secretory pathway to the cytosol . The LDL-receptor binding region (residues 136 to 150), which is rich in positively-charged amino acids arginine, lysine, and histidine, is required for escape in Neuro-2a mouse neuroblastoma cultures . An enrichment in positively-charged amino acids is also seen in the protein-translocation domains of certain viral proteins, suggesting a similar mechanism for membrane penetration . However, such a potential mechanism has not been tested directly on apoE cytoplasmic translocation. apoE is known to have effects on tau pathology, which is a hallmark of AD, although the pathophysiology remains uncertain. Full-length apoE4 expressed in Neuro-2a cultures acts along with zinc to phosphorylate tau via the extracellular signal-regulated kinase pathway, and neuron-specific apoE4 expression in mice results in high levels of phosphorylated extracellular signal-regulated kinase and phosphorylated tau in the hippocampus . apoE3 is effective at binding the microtubule-binding repeat region of tau, the region responsible for the formation of paired helical filaments; apoE4 does not bind this region and thus may not be as effective at limiting formation of neurofibrillary tangles . apoE cleavage fragments (via the processes described in the previous section) have been shown to have effects on the cytoskeleton and intracellular trafficking. In Neuro-2a cells, apoE4∆272–299 expressed by transfection interacts with cytoskeletal proteins to form tangle-like structures containing phosphorylated tau . Mice expressing neuronal apoE4∆272–299 at high levels develop neurofibrillary tangles and die at 2 to 4 months. At lower levels of expression, mice exhibit deficits in learning and memory at 6 to 7 months , and in humans preclinical alterations in cognition more strongly reflect the distribution of tau than of β-amyloid pathology [26, 27]. Any damage to neurons due to apoE4-specific cleavage would reflect a toxic gain of function of the protein. apoE impact on tau has also been proposed to be one mechanism by which apoE4 has a significant impact on neurogenesis and neuroenergetic processes, as discussed below. apoE has been associated with cerebral energy metabolism via both β-amyloid-dependent and β-amyloid-independent mechanisms [28, 29]. Brain imaging has provided significant insight into APOE associations with AD. Cognitively normal, late middle age (50 to 65 years old) APOE ϵ4 homozygotes exhibit significant reductions in glucose uptake (measured as the cerebral metabolic rate for glucose via fluorodeoxyglucose positron emission tomography) in the same parietal, prefrontal, and temporal regions found to exhibit changes in probable AD patients . Additional studies found longitudinal declines in the cerebral metabolic rate for glucose  and gene dose effects . Cognitively normal, 20-year-old to 39-year-old APOE ϵ4 carriers exhibit a significantly decreased cerebral metabolic rate for glucose in similar regions, in this case decades ahead of any apparent pathology or cognitive defects . Recently, the APOE genotype was shown to modulate the cerebral metabolic rate for glucose in normal aging, with no contribution from fibrillar β-amyloid. Additional work investigating mitochondrial activity using cytochrome oxidase histochemistry to measure enzymatic Complex IV function found that young-adult APOE ϵ4 carriers display deficits in the superficial lamina of the cortex, specifically the posterior cingulate cortex . Similar deficits are apparent in AD [35, 36]. Changes in mitochondrial function and glucose uptake may therefore be an early indicator of AD-related risk and physiological alteration. There is evidence that apoE4 has deleterious effects on neuroenergetics via interference with intracellular trafficking as well as through direct effects on mitochondrial function. The cytoskeleton plays an important role in the trafficking of mitochondria . Human apoE4-expressing mice exhibit impairments in axonal transport and accumulate mitochondria in axonal dilations . In PC12 cells, apoE4 can impair mitochondrial motility when compared with apoE3 . Interestingly, small-molecule apoE structure correctors (reviewed in ) that alter apoE4’s structure to be more similar to apoE3 have been shown to ameliorate this effect . apoE4 has also been shown to directly impair mitochondrial function. apoE4 binds the alpha and beta subunits of the F1 portion of ATP synthase in liver , although the functional consequences of this are unclear. In Neuro-2a cultures expressing apoE4∆272–299, apoE4 fragments cause mitochondrial dysfunction that requires the lipid-binding region (residues 244 to 272) . In further study using Neuro-2a, apoE4∆272–299 demonstrated the ability to bind ubiquinol cytochrome c reductase core protein 2 and cytochrome CI of Complex III and cytochrome c oxidase subunit 4 isoform 1 of Complex IV of the electron transport chain. This binding significantly reduced the respiratory function of both complexes . apoE4-expressing Neuro-2a and mouse primary neuron cultures have reduced expression of subunits for all electron transport chain complexes . Complex IV respiratory function is also significantly decreased. Proteomic analysis in mice expressing human apoE found that mitochondrially enriched fractions prepared from apoE4 and apoE3 mouse hippocampus differed in levels of proteins associated with mitochondrial function, oxidative stress response, and organelle transport . In humans, postmortem tissue from the middle temporal gyrus of middle-aged APOE ϵ4 carriers displayed differential expression in 70 transcripts, 30 of which are involved in oxidative mitochondrial function, when compared with age-matched noncarriers . Further work is needed to determine which of these potential insults exhibits primacy or whether all interact to knock down bioenergetic function. apoE4 can induce endoplasmic reticulum stress in astrocytes , an effect that does not occur in neurons . Interestingly, apoE4 trafficking is impaired in the endoplasmic reticulum and Golgi apparatus in Neuro-2a cultures, and small-molecule apoE structure correctors can rescue this impairment . Unlike neurons, however, mouse primary astrocyte cultures expressing apoE4 do not exhibit changes in electron transport chain gene expression . apoE4 may therefore alter neuronal metabolic function via different mechanisms, including direct mitochondrial impairment in the neurons themselves, and indirect effects via harm to astrocytes, which provide neurons with essential metabolic support . apoE isoforms expressed in b12 cells display differing antioxidant ability in a manner correlated with disease risk (apoE2 > apoE3 > apoE4) . In AD, oxidative stress is thought to be an early feature of pathophysiology [49, 50]. 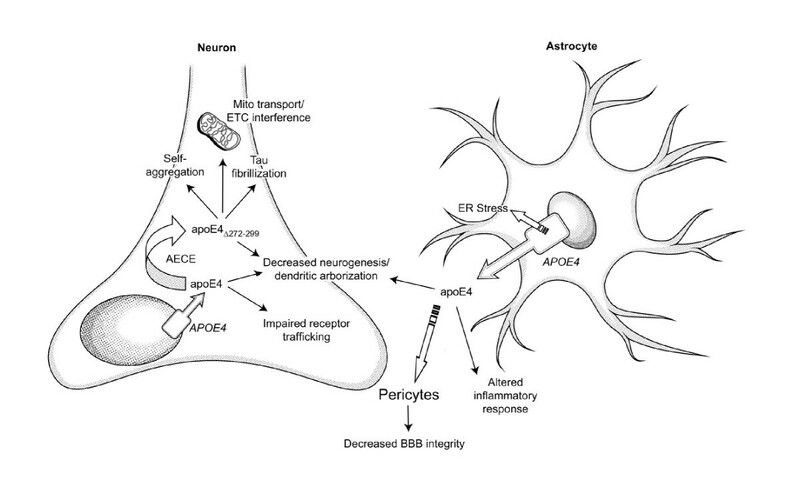 Taken together, effects of apoE on neuroenergetics may represent a toxic gain of function leading to mitochondrial impairment, disrupted trafficking, or astrocyte damage and/or loss of antioxidant or other normal functions (see Figure 1). Effects of cell-type specific expression and aberrant processing of apolipoprotein E4 in the brain. Astrocyte-secreted apolipoprotein E (apoE) is internalized by neurons, but apoE4 expression in astrocytes has been associated with endoplasmic reticulum (ER) stress that may impair astrocyte function. Astrocyte-secreted apoE4 has also been associated with decreased blood–brain barrier (BBB) integrity via signaling in pericytes, decreased synapse development, and alterations in inflammatory response. A smaller proportion of brain apoE expression is attributed to neurons: apoE4 expressed in neurons (but not that internalized from astrocytes) is highly susceptible to cleavage by apoE cleaving enzyme (AECE) in the secretory pathway, becoming AECE-cleaved apoE4 missing C-terminus residues 272 to 299 (apoEΔ272–299). This cleavage product is capable of escaping the secretory pathway, self-aggregating in the cytosol, increasing tau fibrillization, interfering with mitochondrial function and motility, and impairing neurogenesis. In neurons, full-length apoE4 has been associated with decreased dendritic arborization and impairment of receptor trafficking. ETC, electron transport chain. A number of brain imaging studies support a potential differential effect for APOE genotypes in neurodevelopment. In volumetric studies utilizing magnetic resonance imaging, young APOE ϵ4 carriers display thinner entorhinal cortices than noncarriers  and reduced hippocampal volumes compared with both noncarriers  and APOE ϵ2 carriers alone . Additionally, magnetic resonance imaging studies in neonates have found volumetric reductions in several regions of APOE ϵ4 carriers . However, the APOE ϵ4 carrier to noncarrier difference in hippocampal volumes has not been found consistently . The cellular and molecular mechanisms of these differences are unclear, but there are several interesting lines of research. Mice expressing human apoE4 display reduced neurogenesis, which is also apparent in apoE knockout mice . apoE4 fragmentation and tau phosphorylation are also associated with decreased maturation of GABAergic neurons in primary cultures . apoE4 mice also show declines in GABAergic neurons with age that are associated with deficits in learning and memory . These effects are also found (to a more severe degree) in mice expressing neuronal apoE4∆272–299. Mouse studies have also shown that dendritic arborization is decreased in apoE4-expressing mice, compared with apoE2 or apoE3 knockin mice [56, 58–60]. There is also evidence that neurite outgrowth is limited by apoE4, in comparison with apoE2 or apoE3 [61–66]. Microtubule depolymerization associated with apoE–tau interaction is thought to be important to apoE4 effects on neurite outgrowth . apoE has also been shown to be involved in synaptogenesis via its cholesterol transport abilities  and plays a role in maintaining the neural progenitor pool in the adult dentate gyrus . A number of mouse behavior studies have examined the effects of apoE4 on learning and memory, although outcomes have been inconsistent [69–72]. On the cellular level, apoE4 mice display deficits in excitatory synaptic transmission . Interestingly, apoE4 is also believed to sequester apolipoprotein E receptor 2, leading to impairment of reelin signaling and synaptic plasticity, which is not seen with apoE3 and apoE2 . In humans, APOE ϵ4 homozygotes and APOE ϵ4 carriers exhibit declines in memory (as assessed by neuropsychological testing) earlier than APOE ϵ4 noncarriers, and before age 60, while remaining free of clinically significant memory loss [27, 74–76]. Van der Flier and colleagues reviewed an extensive literature and proposed that APOE ϵ4 carriers have a more typical amnestic syndrome with greater hippocampal atrophy and an older age of onset while non-ϵ4-related AD was more likely to manifest as dysexecutive, aphasic, apraxic, and visual variant syndromes with less hippocampal atrophy and a younger age of onset . Murray and colleagues proposed three neuropathological subtypes of AD based upon a large autopsy series including hippocampal sparing (concordant with van der Flier’s non-ϵ4 AD description) accounting for 11% of cases, typical AD accounting for 75% of cases, and limbic predominant accounting for 14% of cases . APOE genotype failed to distinguish these groups. A non-AD clinical diagnosis (including the variant syndromes) was more common in the hippocampal sparing group, but this did not appear to relate to APOE ϵ4 carrier status (in contrast to van der Flier’s hypothesis). In addition to these neuronal effects, apoE plays a role in oligodendrogenesis  – a number of brain imaging studies show white-matter differences in carriers of different APOE isoforms . Further research on apoE’s role in neurodevelopment and synaptic plasticity will be important in linking brain imaging and observational studies to underlying mechanisms, and to determine whether and which of apoE’s potential risk-inducing effects may in fact be congenital in nature. apoE is associated with risk for cerebral amyloid angiopathy and other cerebrovascular conditions including cerebral hemorrhage and vascular dementia, in addition to AD . A significant portion of the risk for cerebral amyloid angiopathy is probably mediated via β-amyloid mechanisms, including effects of apoE on β-amyloid accumulation and clearance. Cerebrovascular alterations are known to play a part in neurodegeneration , and it is well established that patients with AD have impaired blood–brain barrier (BBB) function. Impairment of BBB function can potentially impact blood flow and nutrient supply and clearance of toxic molecules (including β-amyloid), among other activities. apoE4 in particular has been linked to deficits in β-amyloid clearance, and BBB breakdown in AD is most prominent in patients who are carriers of APOE ϵ4 . That said, recent evidence has indicated β-amyloid-independent roles of apoE in cerebrovascular function and dysfunction. apoE knockout mice demonstrate deficiencies in BBB integrity  and also demonstrate an increased rate of decline in BBB integrity with age . In an in vitro BBB model utilizing primary astrocyte cultures from mice expressing human apoE4, the barrier function of tight junctions was impaired . An important recent study utilizing apoE4 mice found that apoE4 promotes BBB decline via an inflammatory CypA–NF-κB–matrix metalloproteinase pathway in pericytes in an age-dependent manner . This effect was not apparent in apoE2 or apoE3 mice. Indeed, these proteins were shown to suppress the pathway via LDL receptor-related protein 1 , suggesting that apoE4 may impair the BBB via a loss of function in comparison with the other isoforms. Further research will be important in clarifying the effects of apoE on the BBB. In addition to these studies, brain imaging has provided some insights into changes in young carriers of APOE ϵ4, with H215O positron emission tomography studies demonstrating alterations in at-rest and task-activated cerebral blood flow [87, 88]. Also, studies in older individuals have identified functional magnetic resonance imaging alterations in the absence of apparent β-amyloid pathology in APOE ϵ4 carriers . Healthy aged APOE ϵ4 carriers also display greater longitudinal reductions in cerebral blood flow as measured by H215O positron emission tomography . Notably, metabolically associated alterations in brain imaging (for example, in fluorodeoxyglucose positron emission tomography signal), such as those discussed earlier, could also be driven by cerebrovascular changes. A large amount of work has focused on the role of inflammation in AD , including interactions with apoE . apoE is known to be involved in the inflammatory response, and has been shown to modulate the expression of several cytokines in vitro and in vivo. In particular, apoE has been studied in the context of the innate immune system. Studies support that apoE4 can be proinflammatory when compared with apoE3 [94–96]. In a recent study in apoE mice, apoE4 (in comparison with apoE2 and apoE3) was associated with increased glial activation, increased levels of microglia and macrophages, and increased T-cell invasion in response to lipopolysaccharide . Interestingly, apoE4 mice also displayed increased loss of synaptic proteins and alterations in cytokine signaling (IL-1β, IL-6, and TNFα) . In microglia cultures from rats, apoE4 is associated with stimulation of prostaglandin E2 and IL-1β secretion . There is also an apoE4 > apoE3 > apoE2 effect in the toxicity to neurons from microglia . Taken together, these findings suggest apoE4 exhibits a gain of toxic function with regard to inflammatory processes. Additionally, apoE is known to be involved in antigen presentation and modulation of nitric oxide production [100–103]. The potential for apoE to impact disease via direct effects on inflammatory processes is intriguing and in need of further investigation. Improving knowledge of how apoE imparts risk for AD is an important aspect of ongoing research. A focus on β-amyloid-independent mechanisms, in addition to more traditional β-amyloid-associated mechanisms, will be vital in developing a comprehensive understanding of AD pathophysiology. Important advances have been made in understanding the relationship of apoE to AD in a number of physiological areas, including lipid metabolism, tau processing, neuroenergetics, neurodevelopment, synaptic plasticity, the neurovasculature, and neuroinflammation. Notably, much of this work has been accomplished in a limited number of laboratories. Encouraging other investigators to replicate and extend these findings in existing and novel models, and the new insights gained by such an expansion, would go a long way both in validating and in delineating the multifunctional importance of apoE in AD pathophysiology. This work was supported by the Arizona Alzheimer’s Consortium, the State of Arizona, the Arizona Alzheimer’s Disease Core Center (P30 AG19610), and the University of Colorado Medical Scientist Training Program (NIGMS 5T32GM008497-20).